( Dr. Jordan Leith, Orthopaedic Surgeon, Burnaby, BC ) is in good standing with the College of Physicians and Surgeons. The speaker in the video may have no association with ( Dr. Jordan Leith, Orthopaedic Surgeon, Burnaby, BC ). 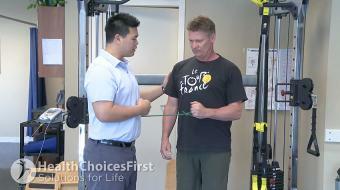 ( Dr. Jordan Leith, Orthopaedic Surgeon ), may talk about some of the conditions and some of the treatment options shown in the videos on HealthChoicesFirst. Always talk with your health care practitioner about the information you learnt from the videos in regards to treatments and procedures the healthcare practitioner could perform and if they would be appropriate for you. Remember good information is the corner stone to understanding your condition or disease. Please contact ( Dr. Jordan Leith, Orthopaedic Surgeon, Burnaby, BC ) to enquire if this health care provider is accepting new patients. Donald is a 65-year-old right hand dominant active gentleman who plays tennis regularly. He visits his family physician complaining of increasing pain to the right shoulder with associated weakness. He states that he can no longer serve or hit the ball overhead. He is having trouble sleeping at night and cannot lie on his right side. He has pain with raising his arm overhead and has clicking on occasion that can be painful. He localizes the pain to the anterolateral side of the top of the shoulder. The physician's examination reveals some wasting of the supraspinatus muscle posteriorly. Donald's shoulder range of motion is full but he has a painful arc of motion. 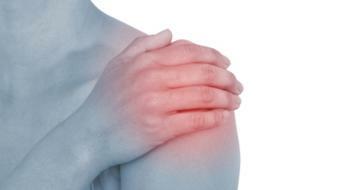 He has crepitus (crackling sounds) within the subacromial region with motion of the shoulder. He has pain with testing supraspinatus power and 4/5 strength. Infraspinatus and subscapularis power is full. He also had tenderness over the supraspinatus tendon insertion and a palpable defect. There was some tenderness to the biceps tendon. Donald is diagnosed with an old rotator cuff injury and could benefit from having an MRI or CT scan on his shoulder to help physicians diagnose this injury and its severity. An orthopaedic surgeon may need to assess Donald for surgical treatment. He may also benefit from seeing a physiotherapist or sports medicine physician to help with strengthening and increasing range of motion again. 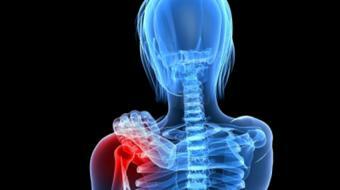 Massage therapy may help to restore blood flow to the injury and relax tense muscles in the shoulder and neck area. Chris, a 17-year-old male competitive skier, fell while downhill sking and had immediate acute pain to the knee. He attempted to continue sking but was unable to turn hard without ongoing pain. He stopped sking. He did not notice any swelling but applied ice right away. He was told by the team trainer that he likely had an MCL sprain. Chris attended physiotherapy but continued to have sharp pain along his medial joint line with routine daily activities. He denied any instability to the knee or swelling. Chris could benefit his condition by ongoing work with a physiotherapist to help him with mobility and a sports medicine physician to further assess his injury. A bracing specialist could help him with bracing options to keep him stable and active. He might need to get an MRI for a better evaualtion. Pilates and massage could also help with his range of motion, swelling and pain. Lastly, an orthopaedic surgeon could help with a surgical consultation if imaging shows that Chris' pain is due to an MCL tear. Strength training is very important at all ages and certainly for people suffering Osteoporosis. Seeing a good personal trainer or a physiotherapist is great place to start to getting good information for the treatment of osteoporosis. 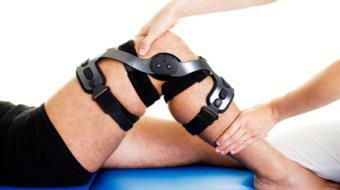 , posted in: What is Basketball-Related Knee Pain? " Sharon a 19-year-old university basketball player "
So if you plant and twist, or you lose your footing somehow, you will potentially tear your ACL. 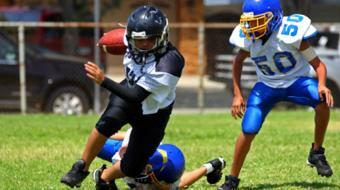 People that tear their ACL will oftentimes say that they feel a pop or heard a pop in their knee. And then their knee feels loose or unstable, or it felt as if their knee shifted. See the whole conversation: What is Basketball-Related Knee Pain? " Sharon a 19-year-old university basketball player "
Dr. Jordan Leith, MD, MHSc, FRCSC, Sport Med Orthopedic Surgeon, discusses shoulder instability after shoulder dislocation. 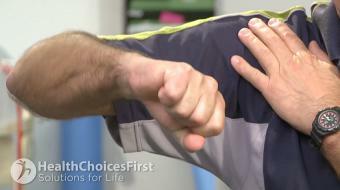 Dr. Jordan Leith, MD, MHSc, FRCSC, Sport Med Orthopeadic Surgeon, discusses what a shoulder SLAP tear is. Dr. Jordan Leith, MD, MHSc, FRCPC, Orthopedic Surgeon, discusses MCL (Medial Collateral Ligament) knee injuries. Dr. Jordan Leith, MD, MHSc, FRCPC, discusses Combined PCL PLC Knee Ligament Injury and surgical options. No fuss or muss. Simple direct opinion and advice. Surgery for me was a meniscal tear done quickly and still haven’t taken pain meds 12 hours post op and likely won’t have to from what I can see. Excellent, friendly, informative service provided. Dr Leith and his team have been very helpful and informative with my shoulder injury. Examinations were very thorough and all my questions were carefully answered and explained. First rate care, thanks! Takes time to explain everything and he is very caring and professional. Very happy with the surgery and all services. Extremely professional and caring. Great doctor and amazing crew. thorough preparation for my surgery. Very organized and excellent job. Definitely the guy to see for any Sports related injuries. Extremely happy with both the surgery and post after care we received from Dr Leith. Would recommend Dr Leith to anyone in Vancouver looking for surgical care. James in Vancouver. My daughter recently had acl reconstruction surgery performed by Dr. Leith and the whole experience from assessment, to surgery, and now the recovery has gone really, really well. Dr. Leith and both his office staff as well as the surgery staff are all incredibly kind, caring and efficient. Many thanks for making an unfortunate injury go as well as it has! I especially appreciate the the email following surgery which covers every question I could possibly have because it's not always easy to remember to ask the things you were meaning to ask on the spot! Many thanks again for everything, Dr. Leith! I saw Dr. Jordan Leith for a dislocated knee and found him to be informative and well educated on the options available to me. Sent me his educational library that I thought was innovative and relevant seeing it has a pre-and post surgical plan with often asked questions. Would recommend Dr Leith to anyone looking for an Orthopaedic Surgeon in Burnaby. Have seen Dr. Jordan Leith on two occasions and have ben happy both times. he is organized and takes the time to explain my problem well. Loved his video based pre-post surgery plan. I recently saw Dr. Leith for a knee injury. I came away feeling very confident that I understood my diagnosis and course of treatment moving forward. He provided me with online information (video educational dashboard at HCF), as well as referrals to a recommended physiotherapist. I would recommend Dr. Leith to anyone. Peter in Vancouver. Would recommend Dr Jordan Leith to anyone looking for a good caring orthopedic surgeon. Has a plan all set up for pre-post surgery and gave me good video information on my condition.